❤ Type of feedback: Extremely positive! ❤ Additional comments / further details about this transaction: She was great, I adored shopping with her and I shall be coming back to her for future purchases! ❤ Additional comments / further details about this transaction: First time trying her SS and I definitely recommend her! Her order form is really easy to use; it's probably my favourite one compared to other shopping services. She was also very willing to help me w/ any questions I had, and had great communication. ❤ Additional comments / further details about this transaction: Angie was the best. Everything went so smoothly and she kept me well informed throughout. I would definitely recommend her service to others, tho I would not recommend EMS for anyone shipping to the Philippines, because despite the awesome service on Angie's end, the Philippine EMS service was a nightmare. But still, without her help, it would have been an even bigger nightmare so she was godsend. ❤ Additional comments / further details about this transaction: I am always happy to use this shopping service and I will be coming back in the future. There was a small issue with the tracking number, but the package simply got to my home before she had the chance to fix it. Nothing terrible. ♡ Was the item shipped when agreed upon? : 5/5 Gave me a range and shipping was prompt. ❤ Packaging: 5/5 Very study cardboard body suited to the doujinshi size and books were wrapped in soft material packed together well. ❤ Additional comments: This was a Toranoana individual order. Recommend this shopping service in the future. She was friendly and I felt very comfortable with the transaction, thank you. She really has great communications and fast ones too, even with our different timezones and all. The items were in great condition and definitely loved when handled. All have their own book wrapper around them.She is even going to translate all the non-fanfiction/novel ones! They were safely packed together in bubble-wrap, so that none could get damaged in the package. 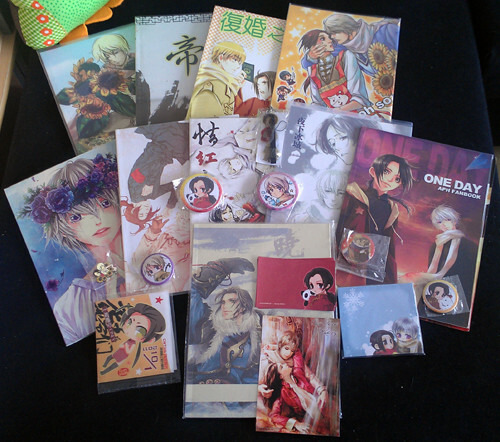 All extras were send with the certain doujinshis as well, in really nice condition as well. Even all the extras I got from this order. They were safely put together in bubble-wrap as well, extra from the books inside the package. The shipping was fast made and arrived just as fast, with tracking included even. Still have a taobao order open with her, which will get an extra comment when the items arrive, but I'd definitely buy again from her! Thank you. ❤ Additional comments: I have used her shopping service a couple of times now and I'm very happy with her service. I recieved my book fast, and I will definitely use her service again in the future. She translated everything that was one needed to know about the item. So I'll put that here, because she very helpful with the translating.